SAI provides professional services, custom development, integration and support. Planning, creating, testing, and deploying an information system can be challenging, and having the right partners can ensure that successful projects are delivered on time. Analytics can be invaluable when they work for you. With hundreds of solutions available, choosing, designing and implementing a solution that works for you can be challenging. We can partner to assess, evaluate, design and implement solutions for your specific needs. Big Data, Smart Data, Data Viz, Internet of Things, Dark Data, Disparate Data; What does it all have in common? Integration. We can help. Annual support agreements are available from SAI Solutions to support any of our offerings and some others. For example, we will support anything that we develop or design, as well as Apache Tomcat and other (mainly open source) products. 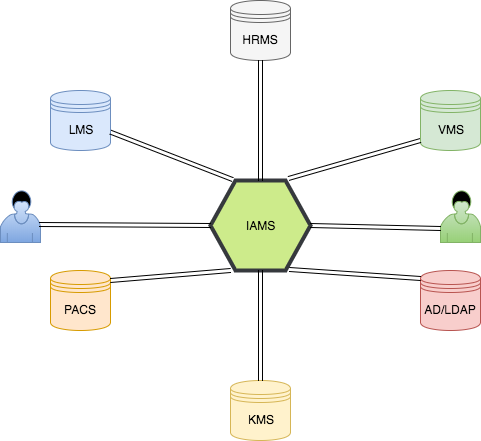 "Integrated systems provide a unified infrastructure"
The Integrated Access Management System (IAMS) is software that helps you audit anything, however you need to. Whether you have automated rules that you need to enforce, such as training or licensing requirements, or regulations that require you to review access periodically IAMS can help. IAMS can be used as a standalone system or can integrate with one or more systems to automate audit the entire auditing process and remove time consuming and error-prone manual data entry. IAMS is available through a web browser for you users so there is no client software to install on anyone's computer. Mobile friendly and with cloud and private installations available, IAMS can fit into any IT environment. Apache Tomcat, often referred to as Tomcat Server, is an open-source Java Servlet Container developed by the Apache Software Foundation. Tomcat is developed and maintained by an open community of developers under the auspices of the Apache Software Foundation, released under the Apache License 2.0 license, and is open-source software. Do you need commercial Apache Tomcat support? Look no further, SAI Solutions can provide support for your organization's Apache Tomcat instances. We have extensive support with application deployment and management using Apache Tomcat. If it's multiple instances per server, virtualized environments, or Docker containers we can help. Annual support agreements are available for SAI Solutions to handle Tomcat installation, application deployment and support, audit remediation support, security updates, and whatever else you need! Please contact us for an estimate to get started. Use the form below to contact with questions or to receive further information. If you would like a phone call, please tell us the best time to call.